The perfect picnic food to share with friends and family. Defrost puff pastry and place on a large (40cm x 30cm) tray, overlapping the two sheets by 3cm. Brush overlapped edge with egg wash and press together well. Score a rim around the pastry of 3cm, by running a knife around the rim 3cm in, but not cutting all the way through the pastry. Egg wash this edge, then coat with sesame seeds. Sprinkle the Parmesan on the inside pastry. To make filling, combine ricotta, basil leaves and egg yolks until smooth, and spread over Parmesan. 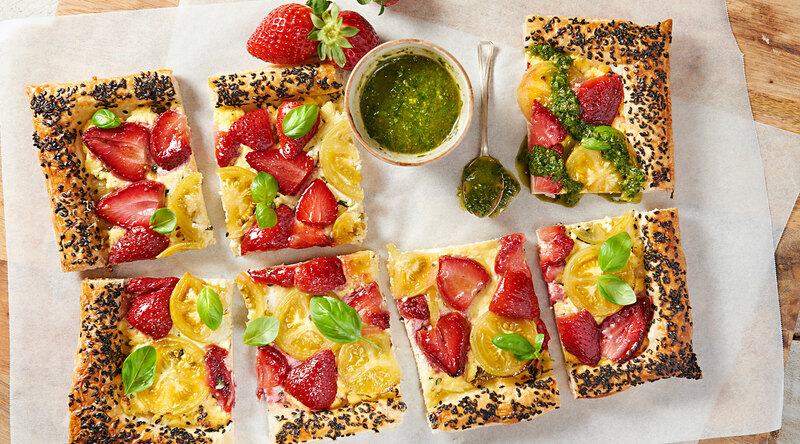 Top with sliced strawberries and tomatoes. Bake for 20 – 25 minutes at 200°C. Cool slightly before slicing and serving. To serve, make a twist on pesto with extra fresh basil, olive oil, blitzed with some red wine vinegar.